A landscaping method which requires little or no irrigation or maintenance, used to conserve water in arid regions. 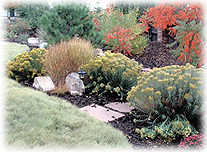 Rather than a specific style, Xeriscape is the employment of seven basic landscaping principles. Each principle is considered in the planning and designing phase, and is installed in a particular sequence. NOTE: See our feature in Taos Counterculture on Xeriscape Gardening and Landscaping.